What Is the relationship Between Western Horoscope and Chinese Horoscope? To my understanding, Western Horoscope and Chinese Horoscope are both true science. Because horoscope is not a subject in the mainstream academic research and college education, most people's knowledge on astrology are very limited. Many people are just taking it for fun. Horoscope talks about the relationship between celestial bodies and human life, which I would say is the very right direction that future science should be marching towards. I suspect that using the word "Zodiac" to address the Chinese cycle of twelve animal-years might be a misinterpretation. 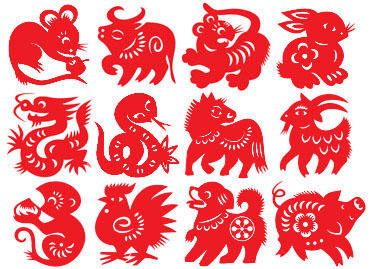 The so called "Chinese Zodiac" is actually a different concept from the Zodiac in western horoscope. Maybe because both of them have twelve items and many of the items are named after animals, the original interpreter connected them together. Papercut art of the twelve Chinese zodiac symbols. Scientifically speaking, the "Chinese Zodiac" can be said as a way of dividing "Jupiter Month" because it takes 12 years for Jupiter to complete one cycle of orbiting the sun. In terms of mapping a Zodiac symbol to a corresponding type of character of a person born in that period, both Western Zodiac and "Chinese Zodiac" are reasonable and correct, but they are different systems. Western Zodiac talks about people's character basing upon people's birth month. "Chinese Zodiac" talks about people's character basing upon people's birth year. So the mapping process and results are all different. In Chinese Astrology, there is a fortune-telling method called "Four Pillars of Destiny" that makes predictions about one's life basing upon one's year, month, date and hour of birth. In this method, if only considering the month of one's birth to predict one's fate, then it is nearly the same as the western Zodiac system. This is the overlapping point between Chinese Horoscope and Western Horoscope. In Chinese culture, people know that persons born in a year of a specific Chinese Zodiac animal have some corresponding type of personal character. This is a general summary of twelve categories of people's characters. This categorization process can go event deeper and more specific. In traditional Chinese Numerology, the Stem-Branch expression of year has a cycle of 60 years. So in this sixty-year cycle, for each Zodiac animal there are five years having the same Zodiac animal. In Chinese culture, these five years of same animal correspond to different Five Elements of Metal, Wood, Water, Fire and Soil. For example, This year 2008 is a Soil-Rat year, while 1996 was a Fire-Rat year. Distinguishing different Rat years by Five Elements enables more specific categorization to be made and the description of people's character of each sub-category is more concrete. In China's "Four Pillars of Destiny" fortune-telling method, this categorization process goes much deeper. It considers not only one's birth year but also month, date and hour. And each time unit of year, month, date and hour is counted by the Stem-Branch Sexagenary numeral system. Therefore, it can distinguish 60 X 60 X 60 X 60 = 12,960,000 categories of people. The description of each category is extremely concrete and specific. Please refer to my page "Horoscope Sign Explanations" for more details on "Four Pillars of Destiny" fortune-telling. Similar to the Four Pillars of Destiny of Chinese horoscope, in western horoscope there are also more complex categorization methods by considering more constellations. I would say western horoscope and Chinese horoscope are different approaches in the research of the same subject. Go to top of this page "Western Horoscope and Chinese Horoscope"